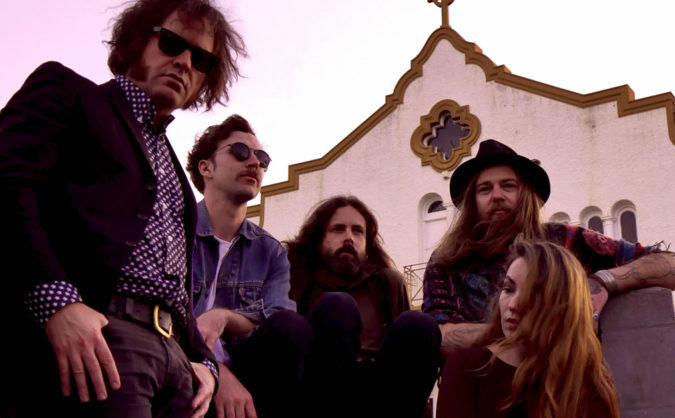 Today, we’re excited to premiere the song ‘Perfect Dream’ from Australian psych/garage cult quintet Sacred Shrines. The band is preparing to release its debut album, Come Down from the Mountain, on November 17 via Rogue Wave Records (preorder here). ‘Perfect Dream’ finds Sacred Shrines deploying an earworm guitar melody that lures the listener towards a cresting groove. Listen below. Come Down from the Mountain is the follow-up to Sacred Shrines’ 2014 double A-Side 7″, ‘Apollo / Hung Up On Your Wall.’ The band collaborated with its favorite engineers from around the world to mix the LP’s individual tracks in an attempt to capture a unique sound for each song. Come Down from the Mountain is a collection of cosmic jams, authentic psych, and contrasting songwriting that includes tracks mixed by Brett Orrison (The Black Angels), Michael Badger (King Gizzard & The Lizzard Wizzard, Demon Parade) and Liam Judson (Cloud Control, The Laurels).